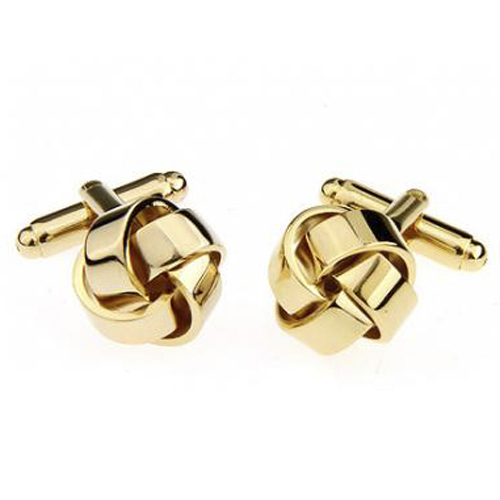 These vintage inspired twisted Gold Knots cufflinks make the perfect addition to any dress shirt giving it some extra pizzaz without being over the top! You have two ways to fasten your cuffs! Either fasten your cufflinks using the Kissing cuff. This is where both ends of the cuff touch and you slide the cufflink through. You will see the nice part of the cufflink on the outside of your wrist, and the back of the cufflink on the inside of the wrist. Or the other choice is the Barrel cuff. Where the ends overlap creating a barrel style cuff. The cufflink goes through so the nice part of the cufflink is exposed and the back of the cufflink is hidden inside the cuff touching your wrist. so why not have a little shimmer of gold knotted about your wrists. also perfect for anyone with a love of all things nautical, no matter the occasion. Comes in a sleek black presentation box.